Globecast in Moscow helps extend Channel One's reach in Europe. Moscow, January 2016: Globecast, the global solutions provider for media, has been chosen by Russian broadcaster Channel One to help them reach the European market (via HotBird) and Asia (via AsiaSat 5), extending its reach to new audiences. 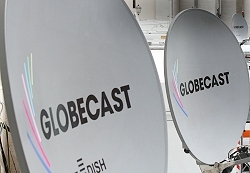 Globecast is providing dual illumination on HotBird with an MPEG-4 channel in addition to the existing MPEG-2 service it provides for the broadcaster. The leading Russian language channel carries a mix of news, documentaries, feature film productions, as well as entertainment content. Channel One’s existing content stream is being re-broadcast to audiences in these new territories, benefiting from Globecast’s global presence and network capacity. The live signal from Channel One is received at Globecast’s Moscow PoP and delivered to London. From there it’s uplinked to HotBird for onward European transmission. For Asian audiences, the signal is forwarded to Hong Kong for uplinking to AsiaSat 5. The addition of an MPEG-4 channel – and the current dual illumination - means that Channel One can smoothly migrate from its existing MPEG-2 SD channel as and when required.